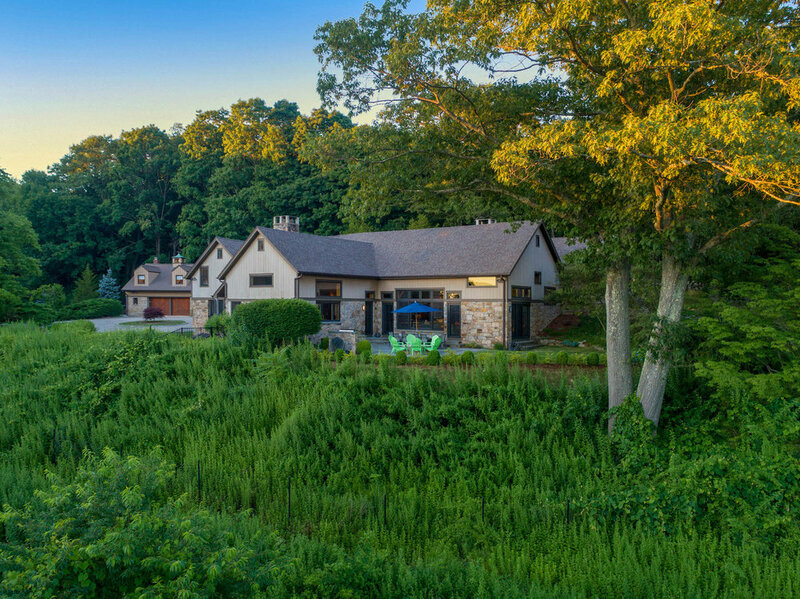 A welcoming country retreat set on 2.7 spectacular acres, this storied Weston residence known as “Apple Hill” was originally moved from Cannon Crossings, in the center of Cannondale, CT. It has been carefully re-imagined for the modern age. Every inch has been restored or enhanced and the results are stunning. A new chef’s kitchen is virtually Architectural Digest ready with updates that seamlessly reflect both a rustic core, and a new vision for a more contemporary and active lifestyle. With unparalleled views of the grounds and access to a sweeping patio, the kitchen may be your favorite spot! Sliding french doors lead from the kitchen to a cozy den where the family can relax before dinner and a sliding barn door gives way to the dining area within the great room. Entertaining guests and gathering with friends will be seamless in the original post-and-beam great room where there is space for everyone in front of the two-story field stone fireplace. On the second floor, relax in the sitting loft with your favorite book or have those more intimate conversations while overlooking the activity and splendor of the great room. Retreat to the luxurious master suite with its commanding views of the grounds and the circular, 45 foot, Slim Aarons worthy pool from its private patio. The other bedrooms all have ensuite bathrooms and are flooded with natural light. There is a fully equipped guest cottage above the detached garage with a living room, eat-in-kitchen, bedroom and full bath. Come see this hidden gem where the best of theatre, music, and film met to socialize and restore themselves with their clever hosts, Lawrence Langner and his wife, Armina Marshall. This home will surround you with comfort and ease; you’ll fall in love with its patina, the magnificent rolling landscape, flowering trees and unparalleled private vistas. After the Langners founded the Theatre Guild in Manhattan in 1918, they began hosting many entertainment greats at Apple Hill. Tennessee Williams, George Bernard Shaw, Eugene O’Neill, Richard Rogers, Oscar Hammerstein, Ethel Merman, Agnes DeMille, and Diahann Carroll all came to Langner Lane! Burt Lancaster also filmed parts of The Swimmer here in 1968, and several sections of The Stepford Wives played out dramatically here in 1975. With their passion for theater (and barns), the Langners went on to establish the Westport Country Playhouse and the American Shakespeare Theatre & Festival in Stratford, CT. Certainly, Fairfield County meant a lot to them. This exceptional home must be seen in person to appreciate its history and timeless appeal.